With seemingly more Norwegian forces arriving on his northern doorstep every day and a precarious relationship with the power hungry English to the south, the Scottish King currently finds himself in a tenuous situation. 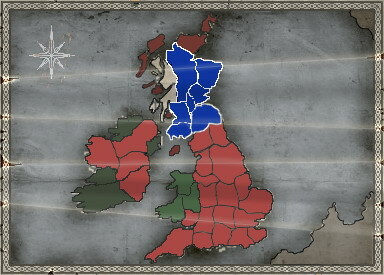 While the Kings wife may be an English princess, it would seem England’s desire to conquer Ireland and control Wales has spread their armies thinly about the Isle, therefore if the chance to re-capture former Scottish territories to the south should arise, the King must be alive to the opportunity. Scotland will also need to consider their diplomatic options when dealing with the Norwegian and English peoples, as it would be unfortunate and potentially fatal for Scotland to become involved in wars on two fronts. As an alternative, an early, pre-emptive invasion of Ireland or Wales may give Scotland the upper hand they need to press on and deal the powerful English a severe blow.